The main point of this weekend was to go up to Worcester to pick up the lathe that I bought from a fuzzy picture on ebay. 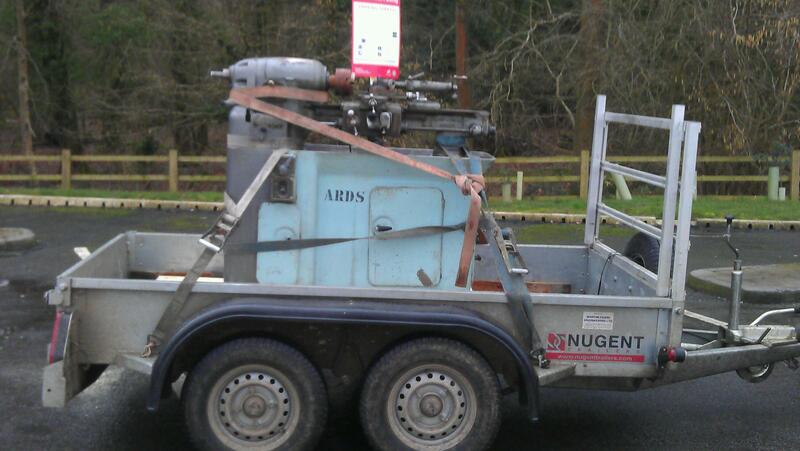 It’s a Smart and Brown Model M Mk2 toolmakers lathe from the 1950s and is soon to be manhandled (400kg?) into my little workshop. I’m going to need to get a phase converter as it’s three phase but I am really pleased. I think you can get much more for your money if you buy three phase. This cost me less than £200 (although a phase converter will probably cost as much). It’s a proper little tool-room lathe and it’s got collets and a three jaw chuck. I’ll just have to start picking bits of tooling up here and there and hope the thing works when it’s all in. Also, I went up to see my dad to pick up my Scott racer’s cylinder block which he’s had to inspect. I thought I’d bring a few more Triumph bits down too but what I didn’t figure on bringing down was another bike; A Silk Scott. Ten years ago or more, he bought this Silk Scott from Roy Lambert (not the late John Underhill as I had originally thought. Apparently John had owned it and sold it on previously). 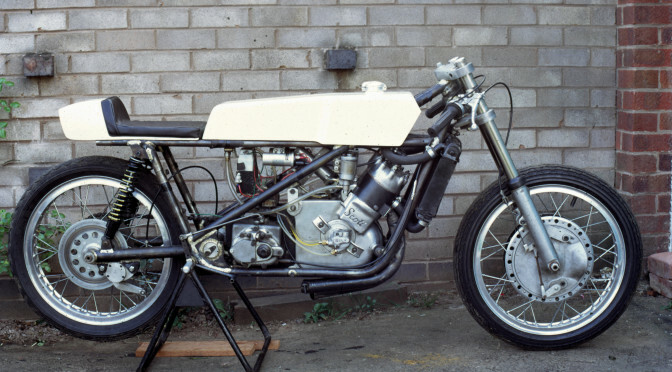 The Silk Scott had been George Silk’s first incarnation of a Scott based motorcycle and had applied 1970’s two stroke tuning theory to the ports and the pipe of an otherwise pretty standard Scott engine. The cranks had been improved and the crank chamber sealing was done with a conventional rubber seal instead of the spring loaded metal to metal gland seal that the original Scott design used. He also created a better oil pump using, I believe, a modified best and lloyd pump design from the vintage period. 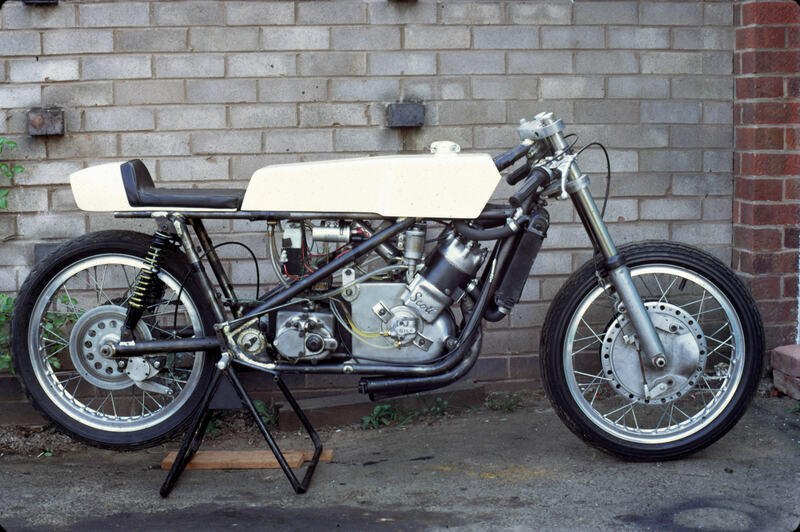 He had a frame made for it out of Reynolds 531 by Bob Stevenson at Spondon which was basically a copy of the frames Spondon made for the small Yamaha racing bikes. Here’s a picture of the Silk Scott prototype. The road bike’s rolling chassis was finished with Spondon 38mm forks, a single sided twin leading shoe front drum and a mechanical disk on the rear. Aluminium rims and a light alloy tank certainly kept the weight down here at least. Basically it’s a complete racing chassis, built to house an engine which had changed very little from 1928. The soon-to-be Moss Silk Scott racer! George undoubtedly released more power from the engine, but at a cost. 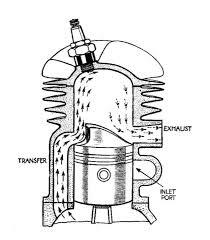 Scotts are not a ‘Schnuerle loop scavenge‘ engine, they are a crossflow engine with the exhaust port and transfer ports opposite each other in the cylinder and using a deflector on top of the piston to send the transferred inlet gas into the top of the combustion chamber, thus scavenging the cylinder. The Scott is notable as a two stroke for having a great amount of torque at low revs, probably because the design does not depend so much on gas velocity to achieve a decent scavenge. Loop scavenge engines, with the transfer ports adjacent to the exhaust port can be susceptible to losing charge directly through the exhaust if the revs aren’t high enough. There are other factors at play, but the torque of the deflector piston Scott really surprises people used to later loop scavenge designs. 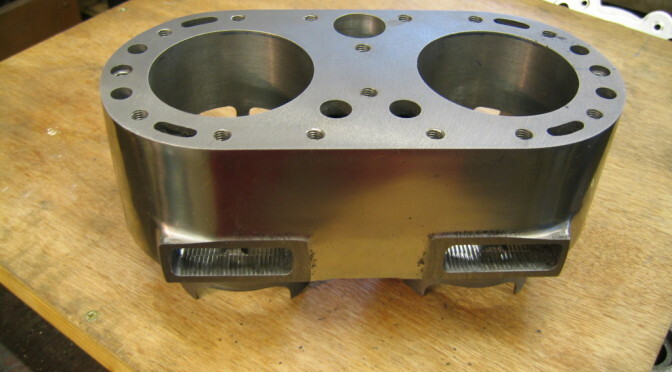 If however, as is often done when tuning a loop scavenge engine for greater power, you raise the exhaust port and the transfer and extend the inlet duration, you tend to lose the bottom end. Maybe that’s ok when you’re able to get a engine producing a significant amount of power a bit higher up the rev range, but Scotts aren’t so keen to rev with that massive hump on top of the piston and also have completely unbalanced cranks, relying only on flywheel damping. Plus the fact that the standard (long stroke) Scott only ever had a three speed box, and the Silk Scott only a four speed box doesn’t enable you to cover a narrower powerband and you start to see where modifications to the original design require an overall consideration of how these things link with each other. Our plan is to build the Silk up with one of my dads racing engines, which only slight differences to the original port timings but has much better gas flow, and work to make a decent set of exhaust pipes to exploit the low rev range available. We originally planned to make the Silk Scott a test bed for the engines we built for people so we modified the frame with the intention of doing a detachable front cradle to aid engine swapping. It’s going to be tight to get it done this year, but I’m going to get on with it and see how it goes. Nice effort Richard. Very interesting stuff. The Silk Scott has the same oil pump as our 1960 Brum,and its the only other one I’ve seen. The Brum at North Leicester Mcs has a similar pump but throttle controlled. I have one of Georges price lists from January 1970,and the pump complete wth translucent feed pipes was £10 !! 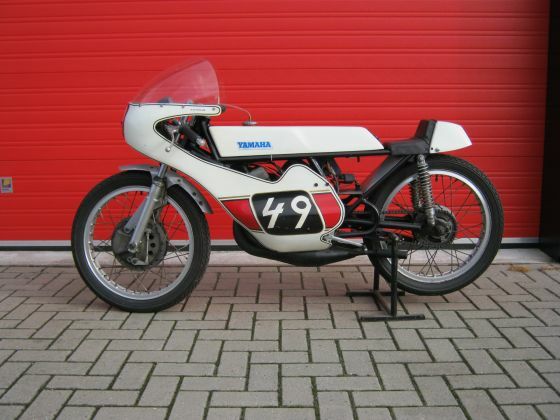 I remember Stuart Tiller at Darley Moor with one of those little Yam 125s which the frame for the SS was based on. Also seeing the American Dave Roper there with a Silk. I believe he was their test pilot for a while. Hi Andy, Interesting stuff. We don’t actually fit door mounted pumps on our engines, but just tend to use Castrol R through constant feed drippers to the mains through little non return valves that my dad makes. We know the guy who previously owned the Birmingham Scott at North Leicester Motorcycles and he may well have fitted the pump to that. I do have a throttle controlled pump I bought a few years ago from an RGV 250 and we had considered modifying it to suit but for actual competition where you are mostly flat out, drippers seem to work fine for us. It is one of the most wonderful things about a Scott engine, that the possibilities of making a modification that needs some kind of drive is so much easier than on many other engines. The two doors, the end of the magneto, the clutch… they’ve all been used for one thing or another. 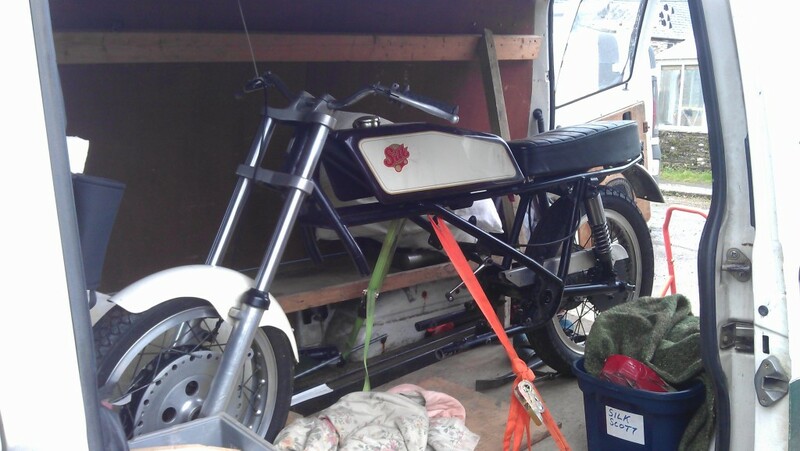 When I was very young, my dad bought a TT replica that had been in this guys shed since the fifties. He was a maintenance engineer and used to do work on it (and a steam engine) when there were no jobs on. It had a vee belt driving an alternator from the clutch and he’d made his own ignition system with a very neat distributor running off the mag chain. Home made covers everywhere…It was great. I think it’s the thing that I like most about Scotts; It’s the sheer potential for them to be a yowling canvas for your own ingenuity. Fantastic. The engine that’s been made for the Silk Scott is one of his full competition engines and he has a ring of magnets inset in an aluminium disk on the flywheel to feed a self generating ignition system. I’d really like to make up disk valve assemblies for the doors (surely someone has done this?) but the other option is a set of reed valve carrying doors of the type my dad made for his brothers bike in the late sixties. I’ll post something about this at some point. 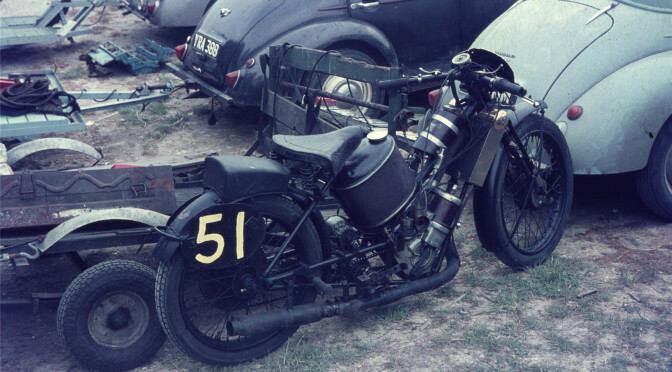 I see on the photo of the Prototype that it has a Gardner carb fitted. THE original flat slide carb. Reputed to be very good once set up properly. Brilliant Ted. I’m so glad you bought that bike as you are someone who’ll appreciate its qualities.. and I could see they might include the ability to wind up anybody who thinks that modifications and specials are only acceptable if they were done ‘back then’, when the world was still in black and white. I love history, let’s keep making it. Electric start… fantastic. Alfred would have loved it, I’m sure.